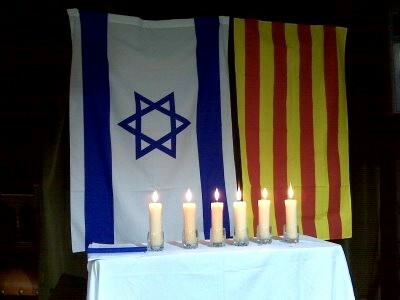 Who can doubt at this point in time that the Jews are behind the so-called ‘independence of Catalunya’. There is no way they could have so much economic and media power if it weren’t for their ‘friends in crime’ from Israel. What we are seeing happening in Spain is the work of Communism. Do NOT let anyone tell you differently. By Saiid Alami * / (R) .- The patriarch of CiU (currently PDeCAT) in Spanish democracy, Jordi Pujol, has never hidden the predilection he has always felt for Zionism. Pujol told me at a meeting with journalists held in Barcelona during the preparations for the 1992 Summer Olympics that he felt Zionist. And he said it defiantly, without being asked, and knowing that among the journalists present we were a large group of Arab media correspondents that had arrived from Madrid. Phrases such as: “The basic idea of being the chosen people, I think, has been a very powerful factor for the people of Israel” and another: “Having the conscience of a chosen people – chosen by God – “Give an idea of the adulation done by this man who works for Zionism, insisted and emphasized that the Jews are a chosen people” by God “, which he repeated several times throughout his intervention. This can be understood as that Pujol recognizes that the people of Catalonia, the rest of Spain and the rest of the world are “vile” compared to the “people” of Israel. Would Pujol or Artur Mas (former president of the Catalan Generalitat) dare to stand before the people of Catalonia and say: “Catalans, recognize once and for all that you are a people of much less rank than the people of Israel …. do you deserve my admiration? “ Do you dare the separatist leaders who both cackle their admiration for Zionism and for Israel to say that same in speeches before the Catalans? Do they dare to acknowledge to their Catalan voters, who have been deceived for decades, that they are actually Zionists and therefore put Israel’s interests above the interests of the Catalans, as is the case with all Zionists in the West? Those American congressmen who recognize that they are Zionists put on their websites that they are in Congress to serve the interests of Israel. Would the leaders and deputies of the CiU dare to be so brave, leave the closet, and declare the same? Because if their souls are trapped by Zionism and by Israel, as they themselves recognize, what the heck are they doing in Catalonia? The answer is simple: to serve the interests of Israel, and everything has its price, of course, that is how all the Zionists of the West, true mercenaries of Israel, work. When Mas visited Israel over 4 days in November 2013, he refused to meet with any Palestinian official, even refused to answer any questions that have to do with the Palestinians at the press conference he staged on that visit. Not only this but he dared to do what no responsible European or American have dared to do: visit the old city of Jerusalem (East Jerusalem) that is recognized by all countries of the world, without exception, as a city occupied, as established by international law led by the UN. With that visit to the future capital of the Palestinian state, Artur Mas attacked, intentionally the Palestinian people, disregarding their nationalist sentiments at heart, he fills his mouth with a nationalism that is remote from Israel. In these same statements Abu Eid goes further and says: “We know that Mr. Mas is not a leader of a State. However, and regardless of his status as autonomous president, international law governs for all. What the president of the Generalitat has done is a serious fault. “ In fact, he virulently ignored the Palestinians, both the people and their perennial tragedy, and the officials of the Palestinian National Authority. The former president of the Generalitat, in his eagerness to lick the boots of the Israelis, came to say in that speech that the Catalans “have Jewish origins.” What did he mean by this phrase so false and full of lies? Maybe put Catalonia at the feet of Israel? Let him explain what he meant by that phrase if he dares. In an attempt to misrepresent and falsify, a ridiculous Artur Mas stressed that Catalonia “welcomed many Jews who escaped the horror of Nazism in the last century.” Useless attempt to rewrite history. At that time (1939-1945), General Franco was in charge of the government, and those responsible for the Generalitat during the Second Republic had fled from Spain. That is to say, if the Jews of whom Artur Mas spoke achieved asylum in Spain was thanks to the Franco regime and not to the Catalan nationalists, who then had no authority. It is striking that this attitude adopted in November 2013, so inclined to Zionism and Israel and so hostile towards Palestine and the Palestinian tragedy, has completely reversed its position publicly displayed in July 2011 when he received in Barcelona the president of the Palestinian National Authority, Mahmud Abbas. Then Mas told reporters that “Palestine and Catalonia are two old nations that, according to this historical tradition and in accordance with this concept of a people and a nation, we perfectly understand those people who wish to live in freedom, peace, and prosperity” Mas said, comparing Catalonia and Palestine. In a press appearance with Abbas, Mas defended “peace” and “freedom” in the Middle East, emphasizing “the closeness” between the two Palestinian and Catalan territories and, therefore, assured to understand the desire for self-determination of Palestine. From his visit to Israel in November 2013, Artur Mas and CiU became radical Zionists. Thus, in July 2015, the Catalan Parliament rejected a motion which called for, among other things, recognition of the Palestinian people’s right to self-determination. The rejection was possible thanks to the votes of CiU and PPC. The review of relations with Israel that promoted that motion also affected Catalan universities, which were encouraged to rescind the current agreements signed with Israeli universities when it is shown that “they have direct complicity with the illegal occupation of Palestinian territories”, point this one that also was rejected thanks to the votes of the CiU and the PP. The position of the CiU in that vote was so hostile to Palestine that it also rejected the text that asked the Government to urge the central government in Madrid to bring to Israel the need to comply with the different UN resolutions in favor of the rights human rights and the Palestinian people. ” That is, both the CiU and the PP agreed that Israel did not comply with UN resolutions or respect international law. 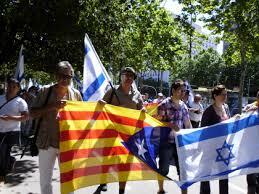 Why is it that Zionism and independence of the Catalan nationalists find such a harmonious consonance with Israel? Israel would have its motives, not by chance we find numerous Israeli journalistic, diplomatic and political testimonies that extol Catalan separatism, instigate it and applaud it. Thus, for example, Adar Primor, editor-in-chief of the Israeli newspaper Haaretz, wrote the following in the aforementioned newspaper, on September 28, 2012, the day after the great independence demonstration that filled the streets of Barcelona under the title Viva Cataluña, Viva Israel): “Just as Catalonia is soon to be the state of the Catalan people, Israel is first and foremost the state of the Jewish people. There will be no future for a binational state, for a federation, for a confederation, for autonomy or for cantons. “ And he closed his chronicle on the demonstration, in which he explained the Catalans’ motives for wanting to become independent, with the proclamation “Visca Israel, Visca Catalonia”. The then Israeli ambassador to Spain, Alon Bar, in an interview with the Catalan Nació Digital and also published by “Help Catalonia” on June 19, 2012, advised the following to the Catalans and their independence movement: “… Therefore I recommend raising a state, respecting your neighbors and negotiating with everyone. I recommend achieving independence through negotiation with all your neighbors. “ That is to say, Israel, according to its ambassador, is very much for the work of which Spain dismembers. And they say it with all the naturalness of the world. The other Catalan independence leaders Carles Puigdemont and Oriol Junqueras. In fact, the vast majority of Catalan independence leaders are Zionists, not just the CiU. Thus, Oriol Junqueras, ERC leader, met Oren Bar-El, minister of political affairs at the Israeli embassy in Madrid on April 26, 2012, a meeting that according to Nació Digital was “intense” and “positive”. What would the Israeli diplomat promise to Oriol Junqueras in an intense and positive interview like that, and for what? Alfons López Tena, a former leader of Solidaritat per la Independencia, stated in an interview with the Israeli newspaper Haaretz on September 28, 2012: “Personally, I am pro-Israeli and a pro-zionist. […] At least half of the members of my party are from the Catalan Association of Friends of Israel. Israel is a democratic state and we support all the steps it has to do to survive. We do not intend to criticize the Israeli Government. We look for cooperation with Israel and hope that Israel will support the movement for the independence of Catalonia. It is clear that independent Catalonia will be a very close friend of Israel. There’s no doubt”. After all this, and many other data that has no place here, there is no doubt that Pujol, Mas, and other Catalan ‘independentistas’, sell Catalonia to Israel and Zionism, behind the backs of the Catalans. The vast majority of the cooperation and collaboration agreements signed by the Catalan Government with Israel are secret, and what the Catalan opposition and the BDS (Boycott, Divestment and Sanctions) Movement in Catalonia require is the publication of all the details of these agreements, which were mostly reached in Israel. * Saiid Alami has been a Spanish writer since 1975. Por Saiid Alami*/(R).-El patriarca de CiU (actualmente PDeCAT) en la democracia española, Jordi Pujol, no ha ocultado nunca la predilección que siente desde siempre por el sionismo. Pujol me dijo, en un encuentro con periodistas celebrado en Barcelona durante los preparativos de los Juegos Olímpicos de verano de 1992, que él se sentía sionista. Y lo decía desafiante, sin que viniese a cuento, y a sabiendas de que entre los periodistas presentes había un nutrido grupo de corresponsales de medios de prensa árabes que habíamos llegado desde Madrid. Más de 15 años después de aquel encuentro de periodistas árabes con Pujol, concretamente el 28 de octubre del 2007, Pujol compareció ante sus amos sionistas en el Knesset (Parlamento) israelí y pronunció un discurso servil que rezumaba sometimiento a sus patronos, que son los dueños y señores de la banca de Nueva York, por la que tanto le cae la baba a este Berlusconi español de reducido tamaño que en la pasada década de los 80, y mientras ocupaba el cargo de presidente de la Generalitat, triunfó como banquero para fracasar después, en los 80 (aquella Banca Catalana, desaparecida en 1984). Frases como: “La idea básica de ser el pueblo escogido creo que ha representado un factor potentísimo para el pueblo de Israel” y esta otra: “Tener la conciencia de pueblo escogido –escogido por Dios- y por consiguiente de pueblo único da mucha fuerza”, dan idea de la zalamería de este hombre al servicio del sionismo, insistiendo y recalcando él mismo en que los judíos son un pueblo elegido “por Dios”, lo que repite varias veces a lo largo de su intervención. Esto se puede entender como que Pujol reconoce que el pueblo de Cataluña, del resto de España y del resto del mundo son “viles” comparados con el “pueblo” de Israel. ¿Se atrevería Pujol o Artur Mas (anterior presidente de la Generalitat catalana) a ponerse delante del pueblo de Cataluña y decirle: “Catalanes, reconozcan de una vez que sois un pueblo de mucha menos categoría que el pueblo de Israel….ese sí que merece mi admiración?”. ¿Se atreven los líderes separatistas que tanto cacarean su admiración por el sionismo y por Israel a decir eso mismo en discursos ante los catalanes? ¿Se atreven a reconocer ante sus votantes catalanes, a quienes llevan decenios engañando, que en realidad son sionistas y por lo tanto ponen a los intereses de Israel por encima de los intereses de los catalanes, como ocurre con todos los sionistas de Occidente? Aquellos congresistas estadounidenses que reconocen que son sionistas ponen en sus páginas de internet que están en el Congreso para servir los intereses de Israel. ¿Se atreverían los lideres y diputados del CiU a ser tan valientes, salir del armario, y declarar eso mismo? Porque si sus almas están prendidas por el sionismo y por Israel, como ellos mismos reconocen, ¿qué puñetas están haciendo pues en Cataluña? La respuesta es simple: servir a los intereses de Israel, y todo tiene su precio, por supuesto, que es como funcionan todos los sionistas de Occidente, auténticos mercenarios de Israel. Pujol reconoció ante el Knesset israelí, en aquel vergonzoso discurso, que es profundamente sionista, desde su más tierna edad y de la mano del fundador del sionismo, Teodoro Herzel, a través del libro de éste titulado “El Estado Judío”: “Como les decía, yo no entré solo en contacto con el judaísmo. También y en un cierto sentido y sobre todo con el sionismo. Y no de manera superficial. Con sólo 17-18 años leí (Der Judenstaat) de Herzel”. El expresidente catalán se deshace en su discurso en enumerar los libros y los textos de autores sionistas que leyó desde jovencito, empapándose de una ideología criminal y profundamente racista, como reconoce él con su concepto de “pueblo escogido por Dios”. Ser sionista, como los son los Pujol, Artur Mas, Puigdemont, PDeCAT y ERC, es ser racista (La ONU reconoce al sionismo como ideología racista en la resolución 3379 de la Asamblea general aprobada el 10 de noviembre de 1975), es ignorar los derechos del pueblo palestino, es aprobar y ser cómplice de las innumerables matanzas perpetradas por Israel en Palestino, Líbano, Egipto y Jordania, es aprobar la expulsión de su tierra del pueblo palestino, es rechazar las incontables resoluciones de las Naciones Unidas que hacen justicia al pueblo palestino y condenan a Israel, es apoyar la política del “apartheid” que constituye la columna vertebral de Israel y ser cómplice en su puesta en práctica contra los palestinos, es rechazar la legalidad internacional y ponerse en contra de la comunidad mundial que reconoce sin paliativos los derechos inalienables del los palestinos. Ser sionista es ser todo esto y mucho más. Ser sionista no resulta ya gratuito, pues obliga a cargarse la conciencia del sinfín de crímenes y atrocidades del sionismo y ser cómplice de todos y cada uno de ellos. Y no es cuestión que admita discusión a estas alturas del siglo XXI, cuando ya tanto Israel como el sionismo han perdido el poder que tenían en el siglo pasado de engañar, embaucar y confundir a la opinión pública de Occidente. Pero todo esto parece que les importa un pimiento a Pujol, y mucho menos a Artur Mas, su predilecto alumno en la disciplina del sionismo racista y cargado de odio, ideología a la que el expresidente catalán se convirtió durante su mandato. Si lo era antes lo ocultaba muy bien, por lo menos hasta el 20 de junio del 2012, cuando declaró durante un viaje a Estados: “Con una visión más grande que la estrictamente europea, tengo ganas de asociar Catalunya, como mínimo, con Massachusetts e Israel”. Cuando Mas visitó Israel a lo largo de 4 días, en noviembre de 2013, se negó a entrevistarse con ningún responsable palestino, incluso se negó a contestar a cualquier pregunta que tenga que ver con los palestinos en la conferencia de prensa que protagonizó en aquella visita. No sólo esto, sino que se atrevió a hacer lo que ningún responsable europeo o estadounidense se han atrevido a hacer: visitar la ciudad vieja de Jerusalén (Jerusalén Este) que es reconocida por todos los países del mundo, sin excepción, como ciudad ocupada, tal como establece la legalidad internacional encabezada por la ONU. Con aquella visita a la futura capital del estado palestino, Artur Mas agredió, intencionadamente. al pueblo palestino, despreciando a sus anchas sus sentimientos nacionalistas, él que se llena la boca con un nacionalismo teledirigido desde Israel. Un portavoz de la Autoridad Nacional Palestina, Xavier Abu Eid, mucho más diplomático que yo (se lo exige el cargo) declaró al respeto, el 14 de noviembre del 2013, que “de forma consciente o inconsciente Mas ayudó a legitimar una ocupación que reconocen todos los organismos oficiales internacionales” (http://ccaa.elpais.com/ccaa/2013/11/13/catalunya/1384373691_470071.html). En estas mismas declaraciones Abu Eid va más lejos y dice: “Sabemos que el señor Mas no es líder de un Estado. Sin embargo, e independientemente de su condición de presidente autonómico, el derecho internacional rige para todos. Lo que ha hecho el presidente de la Generalitat es una grave falta”. De hecho, Mas ignoró virulentamente a los palestinos, tanto al pueblo y su perenne tragedia, como a los funcionarios de la Autoridad Nacional Palestina. En un discurso pronunciado en la universidad de Tel Aviv, durante su mencionada visita, Mas decía que Cataluña había elegido a Israel como “un modelo” a seguir y como “un socio para la innovación”. El ex presidente de la Generalitat, en su afán de lamer las botas a los israelíes, llegó a decir en aquel discurso que los catalanes “tenemos orígenes judíos”. ¿Qué ha querido decir con esta frase tan falsa y cargada de mentiras? ¿Tal vez poner a Cataluña a los pies de Israel? Que diga él que es lo que quiso decir con aquella frase, si se atreve. En un intento de tergiversar y falsificar, un ridículo Artur Mas subrayó que Cataluña “acogió a muchos judíos que escapaban del horror del nazismo en el siglo pasado”. Vano y chusco intento de rescribir la historia. En aquella época (1939-1945), en España gobernaba el general Franco y los responsables de la Generalitat durante la II República habían huido de España. Es decir, que si los judíos de los que habla Artur Mas lograron asilo en España fue gracias al régimen franquista y no a los nacionalistas catalanes, que entonces ni pinchaban ni cortaban. Llama la atención que esta actitud adoptada en noviembre del 2013, tan proclive al sionismo y a Israel y tan hostil hacia Palestina y la tragedia palestina, ha supuesto un vuelco total respecto a su postura mostrada públicamente en julio del 2011, cuando recibió en Barcelona al presidente de la Autoridad Nacional palestina, Mahmud Abbas. Entonces Mas dijo ante los periodistas que “Palestina y Cataluña son dos viejas naciones que, de acuerdo con esta tradición histórica y de acuerdo con este concepto de un pueblo y una nación, entendemos perfectamente aquellos pueblos que desean vivir en libertad, en paz y prosperidad”, señaló Mas, comparando Cataluña y Palestina. En aquella comparecencia ante la prensa junto a Abbas, Mas defendió la “paz” y la “libertad” en Oriente Medio, subrayó “la cercanía” entre los dos territorios palestino y catalán y, por lo tanto, aseguró entender el deseo de autodeterminación de Palestina. A partir de su visita a Israel de noviembre 2013, Artur Mas y CiU se volvieron sionistas radicales. Así, en julio de 2015, el Parlamento catalán rechazó una moción que, pedía, entre otras cosas, reconocer el derecho de autodeterminación del pueblo palestino. El rechazo fue posible gracias a los votos de CiU y PPC. En cambio, en aquella votación, el Parlamento Catalán, gracias a CiU y el PPC, tomó una postura favorable a Israel, rechazando los puntos de la moción que pedían replantear las relaciones de la Generalitat con el Gobierno de Israel, como el que instaba al Govern catalán a publicar todos sus acuerdos con el Ejecutivo israelí y las empresas e instituciones del país. También fue rechazado el texto que reclamaba que el Govern no impulsase ningún acuerdo con empresas e instituciones israelíes “que tengan un papel directo y demostrado en la ocupación y colonización ilegal de territorios palestinos”. La revisión de las relaciones con Israel que promovía aquella moción afectaba también a las universidades catalanas, a las que se animaba a rescindir los actuales convenios firmados con universidades israelíes cuando se demuestre que “tienen complicidad directa con la ocupación ilegal de territorios palestinos”, punto este que también fue rechazado gracias a los votos del CiU y el PP. La postura del CiU en aquella votación fue tan hostil a Palestina que rechazó también el texto que pedía al Govern que instase al Gobierno central en Madrid para que hiciera llegar a Israel la necesidad de cumplir las diferentes resoluciones de la ONU a “favor de los derechos humanos y el pueblo palestino”. O sea, que tanto el CiU como el PP estaban de acuerdo en que Israel no cumpla las resoluciones de la ONU ni respete la legalidad internacional. ¿Por qué será que el sionismo e independentismo de los nacionalistas catalanes encuentra tan armoniosa consonancia en Israel? Israel tendría sus motivos, no en balde encontramos numerosos testimonios periodísticos, diplomáticos y políticos israelíes que ensalzan el separatismo catalán, lo instigan y lo aplauden. Así, por ejemplo, Adar Primor, redactor jefe del diario israelí Haartz, escribía lo siguiente en el mencionado diario, el 28 de septiembre 2012, al día siguiente de la gran manifestación independista que llenó las calles de Barcelona, bajo el título (Viva Cataluña, Viva Israel): “Justo igual que Cataluña va a ser pronto el estado del pueblo catalán, Israel es primero y ante todo el estado del pueblo judío. No habrá futuro para un estado binacional, ni para una federación, ni para una confederación ni para una autonomía ni para cantones”. Y cerraba su crónica sobre la manifestación, en la que explicaba los motivos de los catalanes para querer independizarse, con la proclama.”Visca Israel, Visca Catalonia”. El entonces embajador de Israel en España, Alon Bar, en una entrevista con la catalana Nació Digital y también publicada por “Help Catalonia” el 19 de junio del 2012, aconsejaba lo siguiente a los catalanes y a su movimiento independentista: “…por eso recomiendo levantar un estado, respetando a vuestros vecinos y negociando con todo el mundo. Yo recomiendo alcanzar la independencia a través de la negociación con todos vuestros vecinos”. O sea, Israel, según su embajador, está muy por la labor de que España se desmembre. Y lo dicen con toda la naturalidad del mundo. Carles Puigdemont y Oriol Junqueras. En realidad, la inmensa mayoría de los líderes independentistas catalanes son sionistas, no sólo los del CiU. Así, Oriol Junqueras, líder de ERC, se reunió el 26 de abril del 2012 con Oren Bar-El, ministro consejero de asuntos políticos de la embajada de Israel en Madrid, reunión que, según Nació Digital, fue “intensa” y “positiva”. ¿Qué le prometería a Oriol Junqueras el diplomático israelí en una entrevista intensa y positiva como aquella, y a cambio de qué? Por su parte, Alfons López Tena, ex dirigente de Solidaritat per la Independencia, en una entrevista al diario israelí Haaretz, el 28 de septiembre del 2012, declaró lo siguiente: “A título personal, yo soy proisraelí y prosionista. […] Como mínimo la mitad de los miembros de mi partido son de la Asociación Catalana de Amigos de Israel. Israel es un estado democrático y nosotros apoyamos todos los pasos que tiene que hacer para sobrevivir. No tenemos la intención de criticar el Gobierno de Israel. Buscamos la cooperación con Israel y esperamos que Israel apoye el movimiento por la independencia de Catalunya. Está claro que la Catalunya independiente será un amigo muy estrecho de Israel. De eso no hay ninguna duda”. Después de todo esto, y de otros muchos datos que no tienen cabida aquí, no queda duda alguna de que Pujol, Mas, y demás independentistas catalanes, venden Cataluña a Israel y al sionismo, a espaldas de los catalanes. La inmensa mayoría de los acuerdos de cooperación y colaboración firmados por la Generalitat catalana con Israel, son secretos, y lo que exige la oposición catalana y el Movimiento BDS (Boicot, Desinversión y Sanciones) en Cataluña, es precisamente la publicación de todos los detalles de estos acuerdos, que en su mayoría fueron alcanzados en Israel. *Saiid Alami es articulista en español desde 1975.